This recipe makes enough for 8-10 adult servings, and is great for leftovers. We like to cook in larger quantities so we don't have to cook our main meals every day. Store the leftovers in the refrigerator in a covered dish, pot, or other container. We warm the leftovers in bowls in the microwave oven. We usually begin in advance by cleaning and washing the kidney and pinto beans. They can either be cooked with 10 cups of water in a slow cooker on low heat in about 8 hours or on the stovetop in a pot in about 3-4 hours. 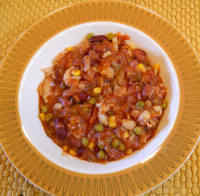 If cooking in a pot on the stove, bring the water to a boil on high heat and then reduce the heat to simmer until the kidney and pinto beans are tender. When the beans are cooked, we place a large soup pot on the stove top and bring 1/2 gallon of water to a boil. While the water is heating, wash and clean the fresh veggies, and peel the carrots and onions, and shred or cut them into medium to small pieces. Place the frozen corn and peas to the water in the soup pot, and mix well to make sure the veggies are not sticking together. 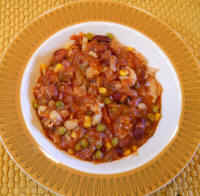 Add the cut or shredded veggies to the pot with the fennel seeds, oregano, crushed tomatoes, and hot pepper, mix well. When the water begins to boil again, reduce the heat to simmer until the onions become semi-translucent, and the veggies are tender to your taste. When the veggies are tender, add the brown rice elbows and mix well; cook for about 8-10 minutes, mixing ever minute or two, until the elbows begin to get tender. Add the cooked kidney and pinto beans, tomato paste, and mix well on simmer or low heat to keep the contents warm. By this time the brown rice elbows should also be fully cooked; if not, cover the pot, turn the heat off, let stand for several more minutes until the elbows are tender to your taste.